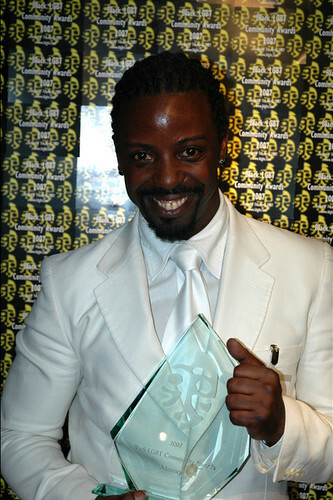 The Stop Murder Music campaign won the Advocacy Award at the Black LGBT Community Awards 2007 ceremony in London. The awards ceremony was held at a gala dinner event on-board on a luxury Thames River boat on Saturday evening, 7 April 2007. Dennis Carney, vice-chair of the Black Gay Men’s Advisory Group (BGMAG) collected the award on behalf of the campaign, which involved a partnership between BGMAG, OutRage! and the Jamaican gay rights group, J-Flag. “I thought the BLGBT Community Awards event was fantastic and I was over the moon that the wider Black LGBT community fully recognises and supports the dedication and commitment of the Stop Murder Music Campaign’s work at making homophobic dancehall lyrics a thing of the past, by voting SMMC the winner of the Advocacy Award 2006”. said Mr Carney. “We are honoured to be a part of the campaign and delighted it has won this accolade from the black LGBT community,” said Brett Lock, spokesperson for gay human rights group, OutRage!, which played a coordinating role in the campaign. “The Stop Murder Music campaign targeted reggae dancehall singers who released CDs advocating the murder of lesbian and gay people. We got scores of concerts cancelled worldwide, causing these murder music artists to suffer huge financial losses. Faced with this pressure, they have cut their output of homophobic songs and now rarely make homophobic statements. It has been a huge success,” said Mr Lock. Ted Brown, the veteran black gay activist, won the Lifetime Achievement Award. He was active in the London Gay Liberation Front in the early 1970s, led the campaign against Buju Banton and Shabba Ranks in the early 1990s, and is involved in the Stop Murder Music campaign today. Man of the Year was awarded to black gay pastor, Rev Jide Macaulay. Previously an activist in BGMAG in London, Rev Macaulay is of Nigerian decent. Last year he returned to Nigeria to set up the country’s first gay church. He has since become a prominent Nigerian campaigner for lesbian and gay human rights.